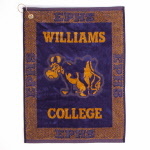 Custom knit purple & gold golf towel with Williams College, Ephs and cow mascot. White beach towel, measuring 30" x 60", with 2 purple stripes and purple & gold WILLIAMS. Purple beach towel, measuring 30" x 60", with gold band that is printed with the cow mascot and WILLIAMS COLLEGE.